The isometric 3D puzzler was breathtaking in terms of its visual design and had nice mechanics, and it managed to earn nearly $6 million in revenue from over 2.4 million individual app sales. But the cost of development might surprise you, as well as the completion rate for the game’s relatively short story among paying players. Monument Valley counted 2,440,076 official sales, which includes iOS, Google Play, Amazon Paid and Amazon Free (via featuring) app installs. iOS drove the brunt of the official DLs (the Android launch also resulted in a piracy rate of around 95 percent, ustwo revealed previously), while Amazon’s free release drove about 4 times as many downloads as did its paid sales. All told, those downloads drove $5,858,625 in revenue to date, with the single biggest revenue day coming on the original iOS launch day, when the title netted $145,530 in 24 hours. 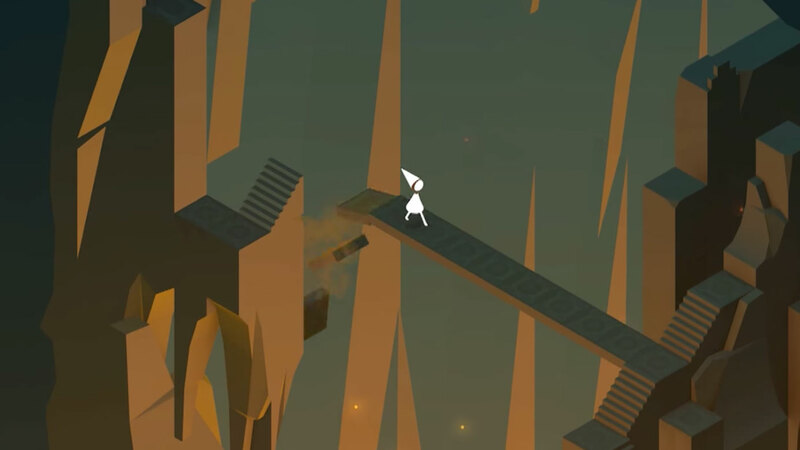 Apple’s reputation for being the platform developers go to in order to make money seems to hold true to ustwogames’ experience – 81.7 percent of the revenue for Monument Valley came from Apple’s mobile platform, while only 71.1 percent of its total official downloads originated on the iPhone and iPad. 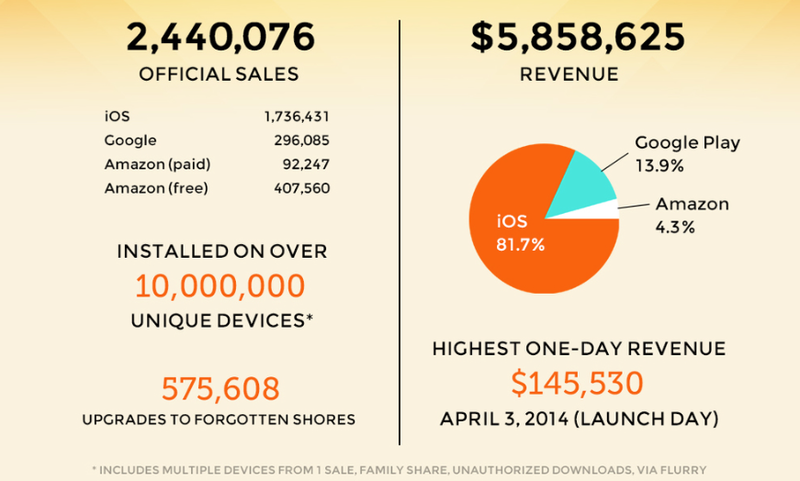 Over 10,000,000 devices actually saw Monument Valley installed, despite the official sales total, which includes users putting it on multiple gadgets, family share installs, and the huge obfuscated beast that is unauthorized downloads. 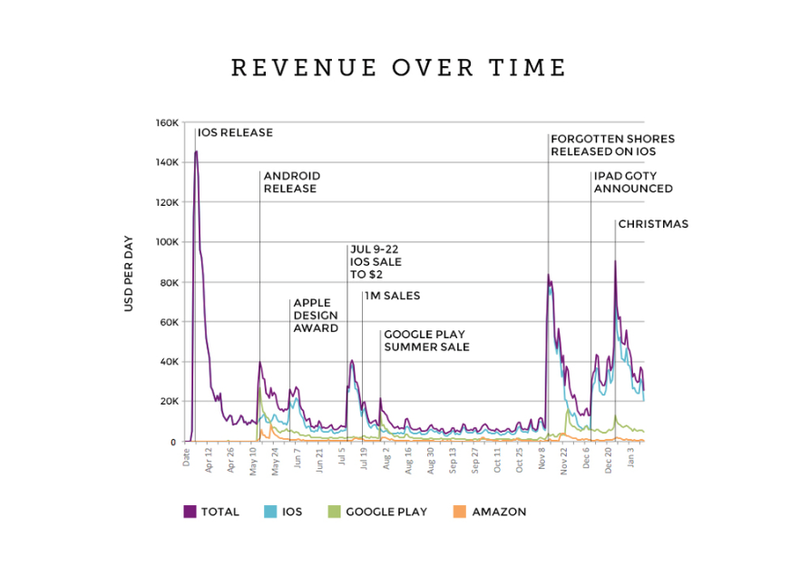 Ustwo also breaks down traffic over time, with the noteworthy events in the game’s history marked to explain spikes. The key takeaway here really is that just about any press or media attention can help spark a run, though launches were the most powerful, (including the launch of Forgotten Shores), as well as Christmas. Even accolades like the Apple Design Award Monument Valley picked up at WWDC last year, and the iPad Game of the Year nod it got near year-end couldn’t come anywhere close to competing with just making new content available. 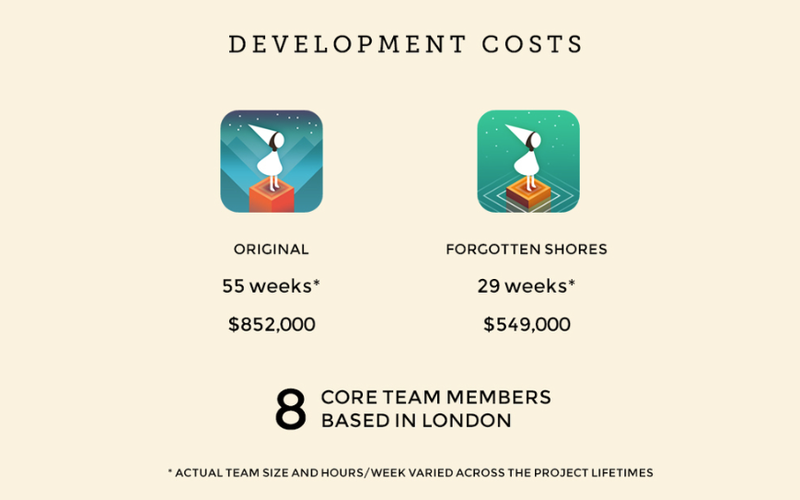 The other really interesting detail that ustwogames shared is the total development cost of both the original game and the Forgotten Shores expansion: 55 weeks of development time for Monument Valley proper cost $852,000, while a 29-week development cycle for Forgotten Shores was worth $549,000 in team salaries and incidentals. Also worth noting are the game completion rates: Monument Valley is rare in that players are paying upfront for a complete experience with a plot that you can work through in less than a day, yet only 50 percent of players who started finished the game. 24 percent of Monument Valley customers paid for Forgotten Shores. Despite the 5 percent completion rate, however, players somewhat unexpectedly tended to play later chapters more often than earlier ones, especially when talking about the original level set. Monument Valley is somewhat of an outlier in terms of mobile games, in that it eschews the freemium model favoured by many of the top-grossing titles these days. But the stats they’re offering still provide a great resource for anyone thinking about trying anything similar, or for players just curious about how the mobile gaming industry works from the other side.